We love maps and infographics at Foxtrot Alpha, and animated ones are that much better. 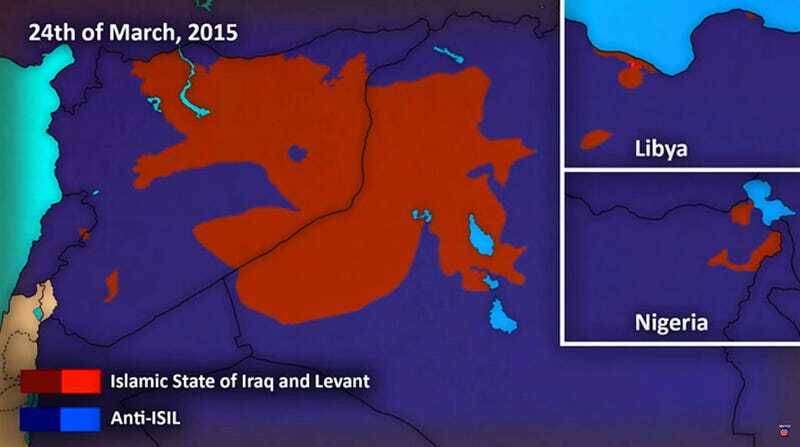 The video below depicting the expansion of ISIS controlled territory over time is especially interesting. After explosive expansion in 2013-2014, now it seems that when any territory is taken back from the Islamic State they just expand elsewhere. Also of interest is just how little ground has been taken back from ISIS even after almost a year and a half of coalition combat operations against it. On the other hand, it must be noted that some of the wide areas shown on the map that ISIS supposedly controls is just empty desert, and the same can be said for much of the non-ISIS controlled areas highlighted in purple. ISIS’s great recruitment tool is the vast territory they still control even after a year and a half of constant coalition airstrikes. By just holding on against what they deem as an imperial force of infidels they retain high-credibility within their twisted world. Unless the coalition gets serious about totally overhauling its strategy and aggressively reducing ISIS footprint via ground operations, and holding that ground after, don’t expect the Islamic State to be greatly weakened anytime soon.